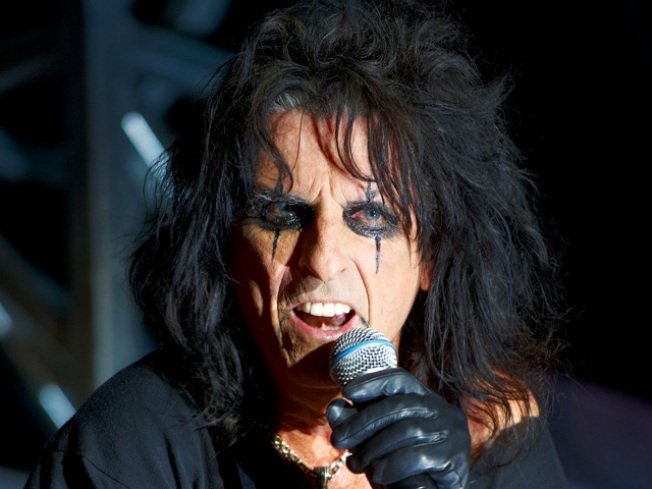 Alice Cooper, the Prince of Darkness himself will be joined on stage by Rob Zombie at Mohegan Sun Friday night. HORROR SHOW: They are the ultimate freak rockers (is that a genre?). Friday night, they're joining evil forces to bring you one of the most enjoyably frightening shows you've ever seen. Rob Zombie and Alice Cooper are invading Mohegan Sun Arena as part of their Halloween Hootenanny Tour. Zombie is taking a break from his horror-movie directing to tour in support of his latest solo project, Hellbilly Deluxe 2. Cooper, who's been at the front of the shock-rock for decades, is taking a break from the golf course for the scary stage show. Joining Cooper and Zombie is special guest Murderdolls. Be prepared for a thrilling night of music. Tickets are $45. The show starts at 7 p.m.
CLASSIC GOTH: Combine cello music, Goth sensibility and rock music? Find out Friday night at Fairfield Theatre Company, StageOne. Rasputina is taking the stage. Since 1992, the trio bucks just about every rock and pop trend you can think of to create music all their own (their front-woman Melora Creager doesn't even really listen to contemporary rock). But what they do create certainly turns heads (the aforementioned Creager played cello with Nirvana on their In Utero tour). You know what, words won't give you an idea what Rasputina is all about. Just go to the show and find out for yourself. Tickets are $22. The show starts at 7 p.m.
TIME WARP: It's the build-up to Halloween, and that can only mean one thing, or two actually. It's time for the late night... double feature... picture show (in the back row). That's right, The Rocky Horror Picture Show is making its annual emergence as everyone's favorite guilty pleasure. Check out Brad, Janet, Frank-N-Furter, Magenta, Riff Raff, Eddie and all the rest, when the play that inspired the cult film hits the stage at the Warner Theater in Torrington Saturday night. The risque tale of straight-laced lovebirds who seek refuge in an eerie mansion is one of the most interactive shows around. In fact, you can even get your very own audience participation bag for just $5. It includes a mini water pistol, latex gloves, playing cards, a glow stick, confetti and a newspaper (real fans of the show likely know what all those things are used for). Tickets are $22. There are performances at 8 p.m. and 11:59 p.m.
GREENING YOUR WEEKEND: It's all about being eco friendly this weekend in Hartford. If you head to the Connecticut Science Center Saturday you'll be overcome by the color green (or at least the feeling of green). Out Of This World: The Green Gala is an evening of celebrating all things environmentally friendly. The food features locally grown and organic ingredients, things like tomatillo and cilantro gazpacho, lamb Wellington, pan fried shrimp with toasted quinoa, and native pumpkin tarts for dessert. The flatware is even green, it's compostable and made from corn starch. And the whole event is powered by a hydrogen fuel cell. Tickets for the Gala are $135-$150. Go Green from 7 p.m.-11 p.m. LOOKING FOR LAUGHS: There are all sorts of funny men and women taking the stage this weekend across Connecticut. Friday and Saturday night, make your way to City Steam in Hartford to check out Jon Fisch perform. Fisch was a fan favorite on season four of Last Comic Standing (seen right here on the Peacock), thanks to his humorous insights into things like dating, marriage, even travel-size shampoo. Jimmy Faila, Jim Gallagher and Mike Jacobs are also on the agenda. Tickets for Friday's 8pm and Saturday's 7 & 10 p.m. shows are $15. Or, you can mosey on over to Waterbury to see the ladies in action. Women in Comedy starring Loretta LaRoche & Friends is hitting the Palace Theater Saturday night. Described as the Goddess of Guffaw, Loretta LaRoche has been entertaining audiences for years with her one-woman show, but she's also an author, motivational speaker and Emmy-nominated PBS star. Loretta is joined by Christine Hurley Runner Up from Nick at Nite’s America’s Funniest Mom Contest and acclaimed comedian, Lesley Smith. Tickets for the 8 p.m. show are $31-$41. DRAMA, ON AND OFF STAGE: It never fails, you go to a show, and some moron is sitting in front of you crinkling candy wrappers, or sits behind you and keeps kicking your chair. Well imagine that annoyance times ten. That's the premise of "A Night in the Theatre," on stage this weekend at Phoenix Stage Company in Naugatuck. The comedy is about two couples who attend a performance about "Hamlet," but instead of watching the show, they spend most of the evening talking about themselves, their kids, friends and sometimes the play. There are performances Friday and Saturday night at 8 p.m., and Sunday at 2 p.m. Tickets are $18-$20.